CEOgolfshop offers the entire line of Club Glove world-class golf bags. We're still adding items to the store- Call now for immediate price quotes. CEOgolfshop sells personalized Club Glove products only- custom embroidered with your name, initials, or company logo. If you need a personal golf bag, please visit your local retail store such as Edwin Watts or Golf Galaxy. Nearly every tour player owns one- not paid sponsors, owners by choice. 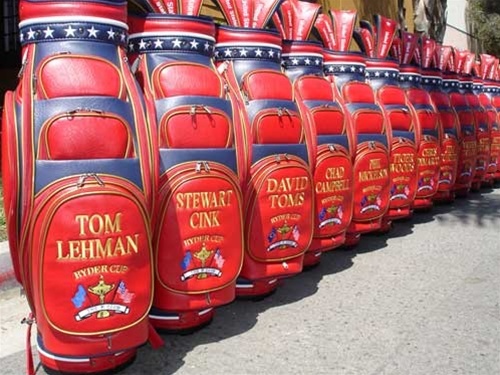 Complete customization offered so you can design your own bags just like you see for these Ryder Cup Golf Bags. Personalization with your name and logo is optional. Huge selection of in stock styles and colors. Best golf towel period. Tour size microfiber golf towel personalized embroidery with your logo or initials. Demanded by tour players and their caddies, this 17" x 40" pro-sized towel has remarkable qualities not found in any other microfiber golf towel. Best seller now includes a free greenside pocket towel with every full size towel. Over a dozen colors including red, black, navy, white. Made by Club Glove. Personalized wood covers in red, black, navy, yellow or white. Add your name or monogram initials. From fairway woods to drivers, made by Club Glove. Custom wood covers in red, black, navy, yellow or white. From fairway woods to drivers, made by Club Glove. Custom embroidered logo. Six pack of tour size microfiber golf towel with free embroidery for personalization. Demanded by tour players and their caddies, this 17" x 40" pro-sized towel has remarkable qualities not found in any other microfiber golf towel. Best towel ever now includes a free greenside pocket towel with every full size towel. Pricing is for a single color towel for all six, and free embroidery on the caddy towels only. BLACK Rolling duffle bag III XL is large enough for two or more weeks travel. Add a custom embroidered name, logo or one college logo. Perfect for CART BAGS, The Last Bag is the best touring golf travel bag in the world and is used by more touring professionals on the PGA, Champions, and LPGA tours than any other product in golf. ADD your LOGO and you'll have a tournament executive gift! Rolling duffle bag large enough for one weeks travel. The Last Bag XL is used by 90% of all touring pros. Perfect for Billboard Bag owners. Customize it with your name or sponsor logo. Carry on bag with rollers and features not found in other carry-on luggage. Best Golf Travel Bag- The Last Bag by Club Glove.